1941. 3-storey, 3-bay, flat-roofed square-plan 2nd World War control tower, now in use as a museum. Smooth cement rendered brick. Multi-pane metal casement and top-hopper windows. Cantilevered balcony extending length of NW elevation, wrapping round outer angles, external metal stair rising to roof to NE elevation. Regular fenestration to NW elevation, remainder reflecting interior layout. Interior room plan remains. Main control station on 3rd storey, leading to exterior balcony and access to roof. The control tower at Dumfries and Galloway Aviation Museum is one of only two situated on RAF bases in Scotland which are three storeys in height, the norm being two. The tower has survived virtually unaltered, retaining all of its original windows, internal layout, and many other period fittings. It is surviving evidence, both of the importance of military aviation to the area, and the importance of the base to the defence of Britain during the Second World War. RAF Dumfries, opened in June 1940, was used as an Aircraft Storage Unit (ASU). Given its distance from mainland Europe the base was strategically useful for the storage and maintenance of aircraft away from imminent danger of attack. 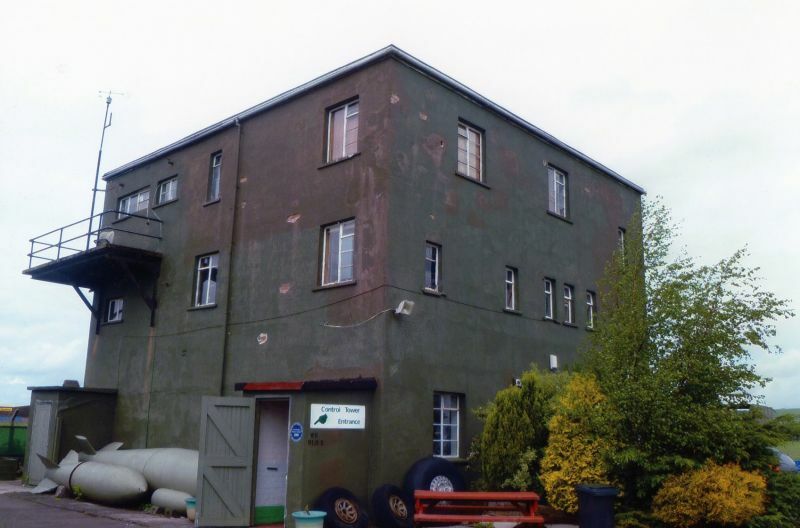 This base was home to the number 18 Maintenance Unit and in 1940, was allocated to 25 Group Training Command following the decision to move number 10 Bombing and Gunnery School from Dorset to Dumfries. The importance of the base is reflected in the fact that by the end of the war over 400 courses had been trained at Dumfries and it is estimated that 18 MU had prepared and dispatched over 5000 aircraft. The training squad disbanded after the war but 18 MU continued until 1957. The station then became a training base for RAF national service recruits until 1957 when military use at the base ceased. The aircraft museum has been based at the control tower since 1979. A housing development now dissects the former airfield and only a fragment of the runways still remain. In addition many of the original airfield buildings have been lost or have been heavily altered or restored. The control tower, as a key building to the airfield is therefore of particular interest because it survives virtually intact.